Topical Sermon Outlines explain how to create sermon outlines so that you can preach topical sermons to your congregation. All sermons have some form of structure so that you can preach your message in a cohesive and sequential way. Your sermon outline should be that structure. So, how do you write a sermon outline for your topical sermon? Before I answer the above question, let me make a couple of observations. A sermon has three parts - introduction, body and conclusion. The body of your sermon is the sermon outline. The sermon outlines also has three parts - main preaching point, sub-points and incidental points. Recently, I wrote a sermon on Christian love. Once I decided on the topic, I developed an angle or perspective to that topic. I wanted to look at the expressions of Christian love from Romans 12:9-13. From there, the topical sermon outline developed. When I write a topical sermon outline, I usually keep three features in mind. The main preaching point of your sermon outline is the sermon topic with an angle or perspective from which you are going to develop it. For example, if your topic is Christian Love, you can preach this topic from different angles or perspectives. You could look at the benefits of Christian love or the results of Christian love or what is Christian love? In this topical sermon, I wanted to look at how to express Christian love to others. Romans 12:9-13 provides insight into this topic. 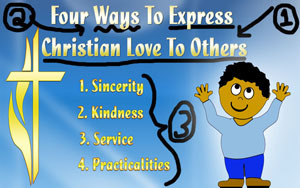 In fact, I discovered four ways to express Christian love to others from this passage of Scripture. Once I have developed the main preaching point of the sermon outline, I look for a key word or hinge word that will help me expand and explain the main preaching point. The key word or hinge must be a plural noun. In the sermon outline above, I used the key word ways. The sermon outline will go something like this: The first way to express Christian love to others involves sincerity. The second way to express Christian love to others involves kindness, and so forth. When you develop a sermon outline like this, you will find that your sermon has cohesion and sequence. That is, your sermon will flow as you naturally expand and explain your main preaching point. When you expand and explain your main preaching point, you will develop sub-points. 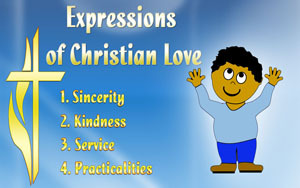 If you are looking at ways to express Christian love to others, then your sub-points should provide that information. Once you have your sub-points, you may need to develop incidental points to expand and explain your sub-points. In the sermon outline above, I wanted to expand the forth sub-point of practicalities. The two incidentals points are Christian love practises generosity and Christian love practises hospitality. Below is a topical sermon outline of Romans 12:9-13 which embraces the topic of Christian love. Once the sermon outline is completed, you will need to add content to your sermon outline. This will include illustrations. To illustrate kindness (second sub-point) with a story can be powerful and life-changing for your hearers. Of course, you will need to add an introduction and a conclusion. I usually do this once I have finished the sermon outline with content and illustration. Free Topical Sermons: Free Topical Sermons provide sermon information on what is a topical sermon and how to write a topical sermon. How To Create A Sermon Outline: How To Create a Sermon Outline explains the ins and outs of writing a sermon outline so that your sermon has structure and flow when you preach it to your congregation.